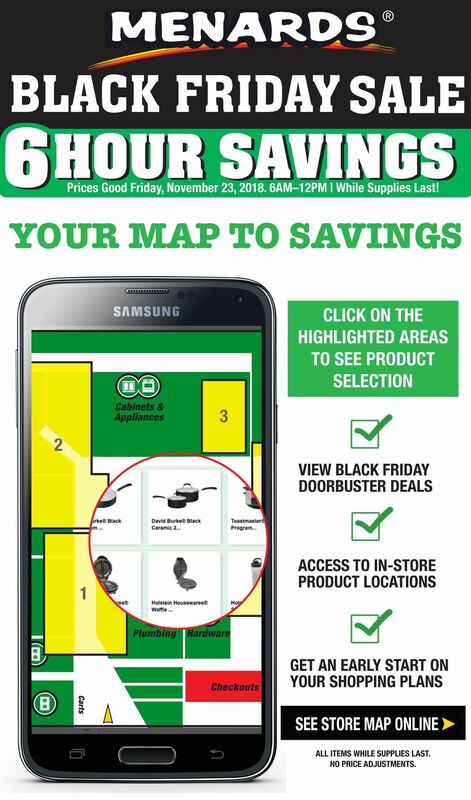 Menards Black Friday 2018 Deals will be live from 6AM on Black Friday 2018 until noon. Stores will be closed – Thanksgiving Day. Best Menards Black Friday Doorbusters: Master Force 20V Lithium-Ion 1/2-in. Cordless Drill Kit; Stanley 4-pc. Tape Measure Set; David Burke Cookware 5-qt. Dutch Oven, David Burke Cookware 3-pc. Fry Pan Set or David Burke Cookware 2-pc. Sauce Pan Set; hristmas Embossed Popcorn Tin.